I’ve spruced up my farmhouse porch just in time for your visit! But shhhhh … we don’t want to wake Miss Trixie from her catnap so let’s tiptoe on into the house! 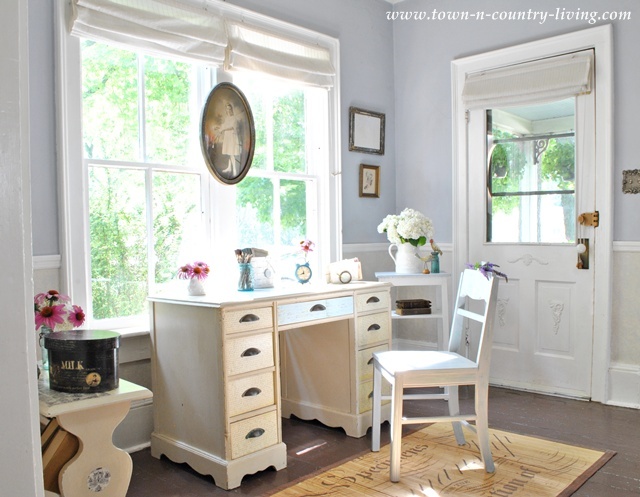 My home was built in the late 1800’s and has everything I love about older homes … big windows, wide baseboards, painted floors, squeaky doors, and crooked walls. You gotta take the good with the bad when it comes to older homes! I love my entry way in the morning when the sunshine pours into the room infusing energy into every nook and cranny. In the family room, I made some recent changes for the season, adding a bit more color. I’ve kinda been on a color kick lately and the main thing I changed in here is the big clock on the wall. 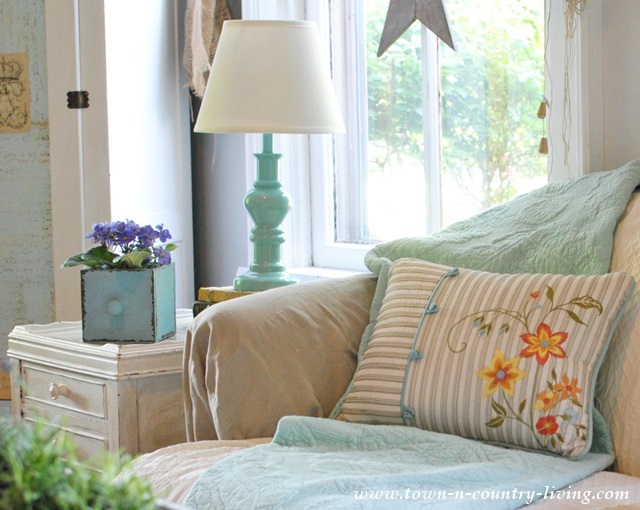 Also new to the family room are the cute, floral pillows and a pair of matching aqua-colored lamps. 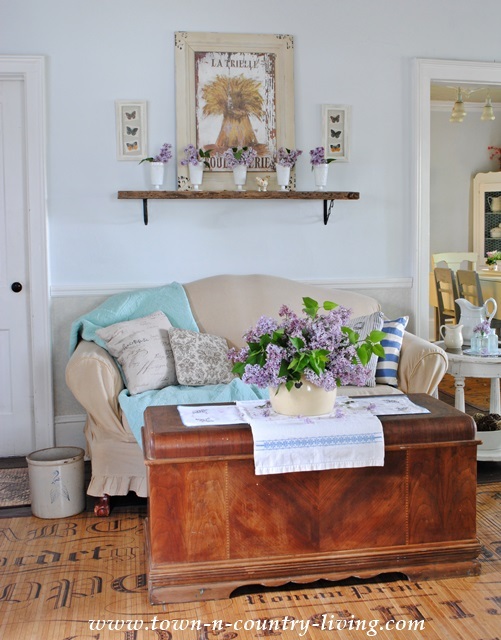 Violets tucked in a tiny drawer add some fun … you can’t decorate for summer without flowers! I had thought about swapping out the landscape burlap swags with white muslin ones just for the summer, but at the last minute I decided to leave them as is. I think the burlap helps provide a little bit of drama in the family room. In the living room I didn’t change things up too much for summer, other than bring in fresh flowers. I did recently paint the living room a slightly lighter shade than it wore before, so I suppose the Steamed White paint gives this room more of a summer fresh feeling now. I get asked a lot about the bamboo script mats I have in my home. I found them at a local boutique but you can visit the manufacturer’s website to find a retailer near you. 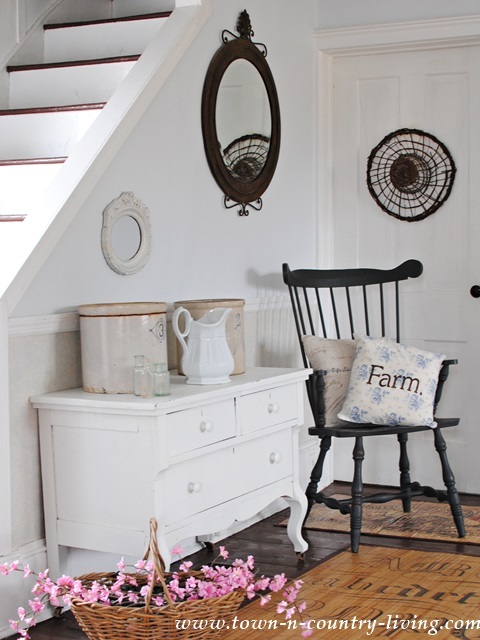 My home is decorated with a lot of flea market finds – no matter what the season. To add a little more cottage style to my dining room, I hung a vintage hankie banner on the corner hutch. We have a new vintage store in town and she has loads of vintage hankies that I couldn’t resist. 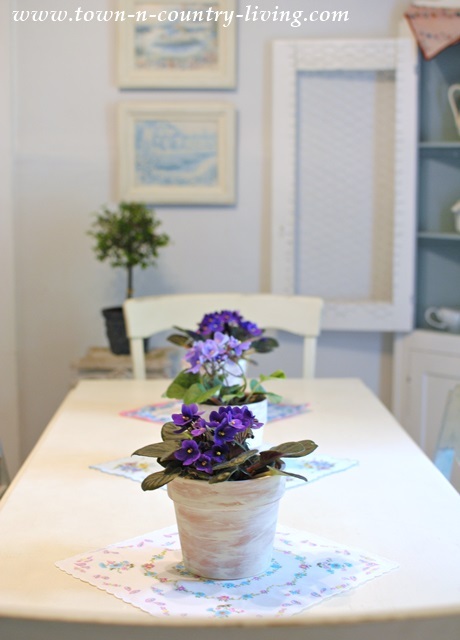 On the dining table, a trio of African violets are placed atop vintage hankies. I thought the hankies would be a fun summer addition! 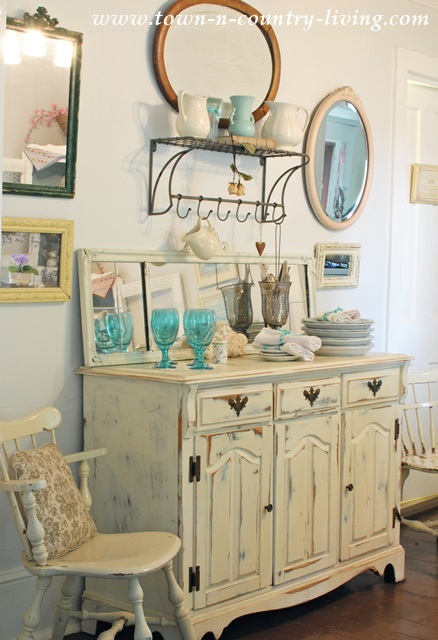 The painted dining buffet has dishes ready to set the table for a light summer meal. 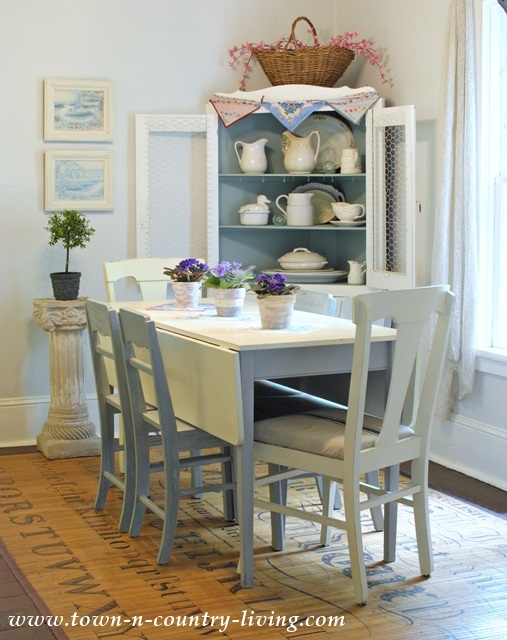 I’ll share more details of my summer dining room in an upcoming post. 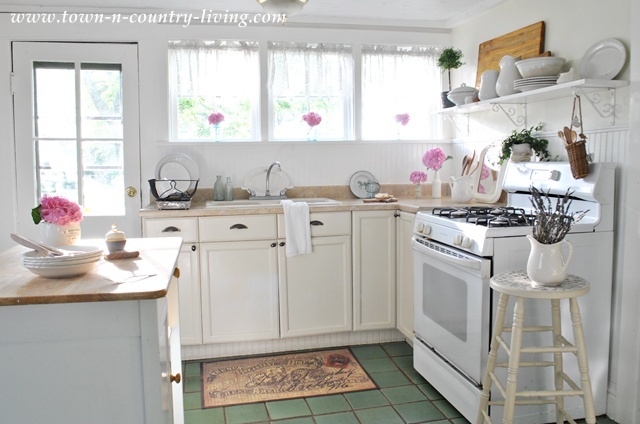 In my kitchen you can always count on 2 decorating staples … flowers and white ironstone! I love my white kitchen which is actually very easy to clean! When we installed the bead board a few years ago, we painted it with kitchen cabinet paint which is extremely resilient! Splatters, dirt, and grease wipe right off without any effort! 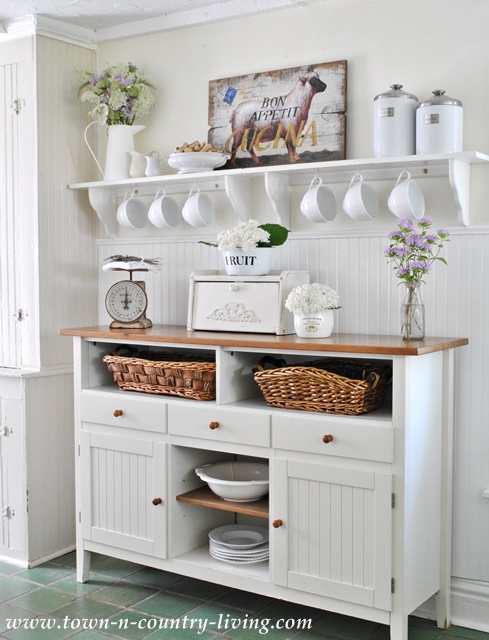 Our kitchen doesn’t have a lot of standard cabinetry but it does have a lot of free standing storage space, like this cottage style IKEA sideboard I purchased from a co-worker who no longer needed it. I think it fits our kitchen perfectly! I get asked about our kitchen flooring quite a bit. I believe it’s Mexican tile and it wasn’t original to the house. You’ll see a lot of vintage mirrors throughout my home … I have a bit of a fetish for them (in addition to white ironstone and vintage bottles). The downstairs bathroom even gets a little summer primping with flowers and new wire baskets. Finally, I’ve been adding summer touches in one of the upstairs bedrooms but I don’t want to reveal too much because I’m sharing the makeover tomorrow as part of the “Fun in the Sun” blog hop with several other bloggers! So stop back tomorrow for the full bedroom reveal. And on Wednesday, you can link up your own summer projects right here and be seen on 14 blogs! This is the outside of my house last summer … we’re currently scraping and painting it and didn’t think you’d want to see that mess! Ugh. I’ll be glad when it’s all done! Don’t forget to leave a comment telling me you want to win the $30 gift card to Decor Steals! Winner will be announced June 30th. Be sure to visit the other inspiring house tours by some amazingly talented bloggers! As a fun bonus, some of these bloggers are also going to be offering a giveaway on their site the day of their home tour so don’t forget to check out all the tours so you don’t miss anything exciting. Here is the order of events for the week… we’re ending with a big day Friday! I love your house! Our home will be 100 in 2016 and I adore it. Don’t you love porches? I want to enter to win. Thanks for such a sweet blog. I love the clean bright feel to your home! 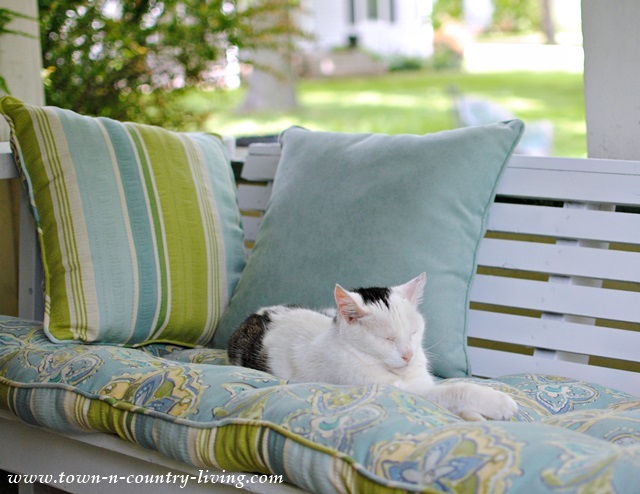 I could sit next to kitty and read a good book on a lazy summer day! Thanks for the tour and the giveaway! 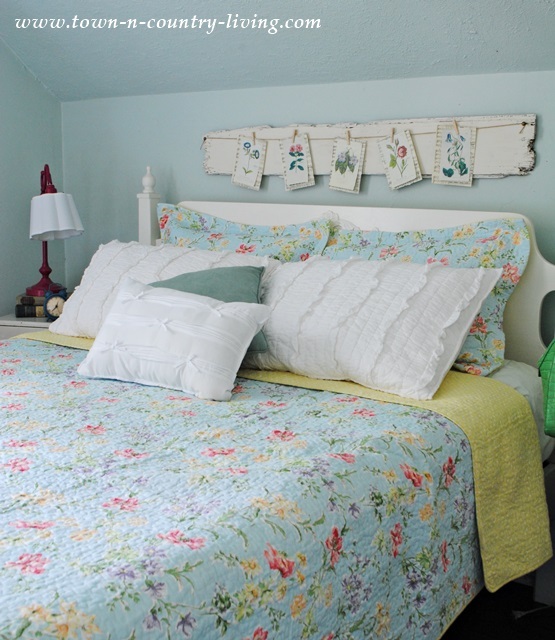 I love touring your home and love the updated bedroom! Your home is so warm and inviting. I esp love your bamboo rugs.. Your home looks so inviting and fresh. I am a fan of Decor Steals as well. Thanks for sharing your world! I want to enter to win your gift card. Love your home and I get inspiration for my cottage every time you post. Keep up the good work! Your home always looks so fresh and pretty. 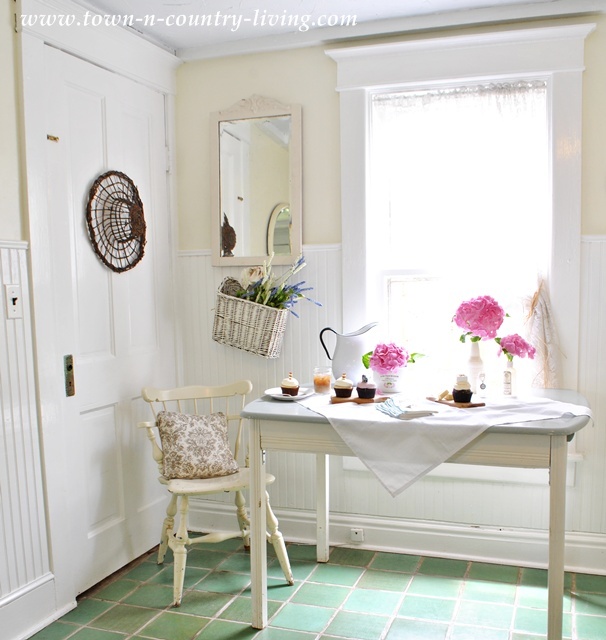 Love the way you sprinkle flowers in ironstone and vintage bottles throughout. Of course, I’d love to be entered in your gift card giveaway! Thank you. your home is just so sweet! it’s so filled with love!!!! i love the living room and the colors added for spring/summer! Your cottage is always gorgeous! I really like the blues and touches of pink you are using right now. Your bedroom is so sweet. I would love to update each bedroom for the seasons every year. Wouldn’t you? I would love to win the gift card. I just discovered Decor Steals. 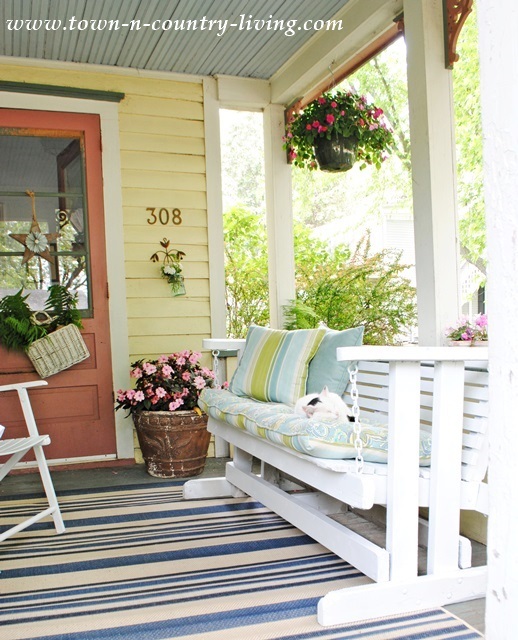 Love your summer home, expecially the front porch. It’s gorgeous! It must be pure bliss to live there! And P.S. 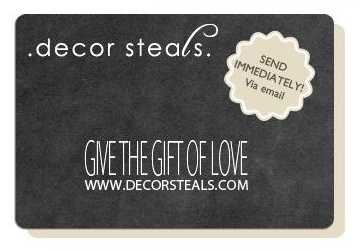 ~ I would love a chance to win the Decor Steals gift card ~ thanks so much! I would love to win the Decor Steals giveaway. Love Decor Steals and love your home tour. Thank you for the opportunity! What a wonderful tour! Your home always looks so warm and charming! And what a fun giveaway! I love how bright and cheery your home is, such a delightful place! I would love a chance to win the gift card to Decor Steals, how very generous of you to have this giveaway!!! I love getting to see your home in each of your posts. Thanks for the tour! I would love to win the gift card for Decor Steals. Thanks for the chance! Please enter me in the Decor Steals gift card giveaway, they have adorable finds! Great tour! Enter me to win…thanks!!! I have been in love with your home since I first saw it J, and every time I see it I love it more!!! (if that’s possible). I love seeing it all freshened up for summer. It looks amazing and I bet Miss Trixie agrees! I would love to enter for the GC. Jennifer I always enjoy seeing you home. You always have the best touches!!! What a beautiful home. I love the bamboo mats! So charming, at first I thought you had stenciled the floor. Please enter me for the gift certificate. Thanks! Great ideas! Would LOVE TO WIN!! Always love to stop by and see your beautiful home, I especially love the outside of it and can’t wait to see it newly painted! Would love to win, always stop and look at what Decor Steals offers! I LOVE you house and I would love to be included in the drawing! Everytime I see your house I judt love it! LOVE your style! I love your home! It is so welcoming & says “Come on in & sit awhile”. I would like to enter the drawing & hopefully win! I love your home especially the entry and that wonderful desk. I also love the hankies. I have been obsessed with hankies for years and have the one that I carried in my wedding framed. It looks adorable and means so much to me but hankies are hard to find where I live. Love your home! I love Décor Steals too- would love a gift card! I love your beachy decor and your front porch is beautiful! Please enter me in your contest, I would love to win! Ps. . . So jealous of Miss Trixie! I would like to enter to win 🙂 I love all of the aquas in your home. It’s so fresh and bright! I always enjoy looking at your beautiful house! Especially the kitchen and bath! I love decor steals and would be so happy to win a gift certificate there! It looks great!!! So fresh. I have a vintage mirror fetish, too. Sign me up for your decor steals deal…and thanks for the op! Please enter me! I would love to win! I love your cozy, inviting porch and your adorable cat. Can’t wait to see the bedroom! I am loving what I see. Thanks for sharing your home with us. PLEASE ENTER MY NAME IN THE DECOR STEALS RAFFLE. THANK YOU. I ALSO ENJOYED YOUR HOME TOUR. Of course, I want to win, but I really want to say how much I love the cottage-feel. Your home is beautiful and the pops of color are perfect through out. I especially love the blue that pops from the white and gives the real feel of coastal living to me. I am working on a bedroom in my house for that feel. Love your home. Go ahead and just pull my name right out of that hat. I’m gonna win it! Beautiful, quaint and charming home. Thanks for sharing. Thanks also for the give away. We are moving next month and would love to win! Decorating a new house is expensive!! Enter me in the Décor Steals gift card please! 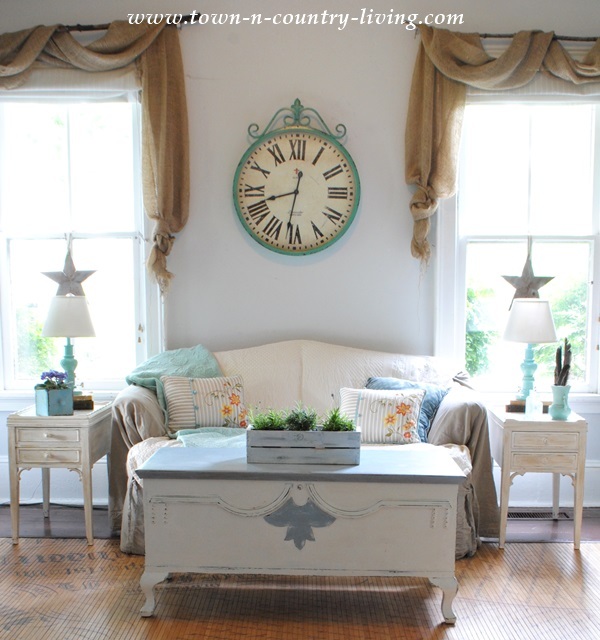 Thanks for sharing so many beautiful summer room ideas – great inspirations. I love your home. We recently sold our 150 year old home after 4 years of renovations and we recently purchased a 129 year old that we are loving. It is a smaller home than our last but I love the painted wood floors, the large windows, the wide baseboards similar to your own home. We will need to paint the outside at some point as well which I am not looking forward to. Right now I am painting the inside as there was a lot of dark brown and mustard gold walls. ugh! I love every single detail of your house. It’s GORGEOUS!! Please enter me into the Decor Steals giveaway. Such a lovely home! I would get the Metal Tapers Candelabra if I won! I love, love, love your home!! I’d love to win the giveaway, too! 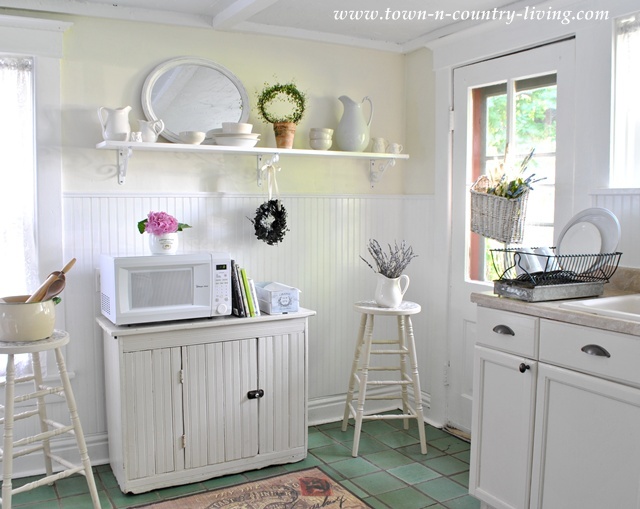 I love this quaint beautiful cottage! Very nice! I would love to enter your giveaway. Your house tour was a real treat, and I love your antique mirrors! Your home looks so inviting and has such a casual feel….I love it. I also love the display of cards above the bed in the bedroom…I may need to “borrow” that idea for a wall hanging! I would love to be entered into your gift card drawing! I’d love to enter and I love your home! I’ve been wanting a preserved boxwood wreath from Décor Steals, so that’s where I’d put the $30.00! Nice giveaway! Love your bright cheery home! I get Décor steals email everyday! I love the deals they have! Thanks for the opportunity to win a gift card! Thank you for the summer home tour. You have a beautiful home. I love all the details that you put into each room. I love to enter for gift card. Thanks again. Thank you for sharing your summer house tour. You have a lovely home! I would love to enter the giveaway! Thank you for the beautiful tour. Your home is so lovely. I specially loved your kitchen and front porch. Casual yet feminine. You have nailed your style! Love your style! Your vintage handkerchief banner is a great idea…I’m going to be digging out my own handkerchiefs today. 🙂 Your care for your lovely home shines throughout the rooms. Thanks for the tour! I love your décor and blog. Please enter me. I would love to win! Your home is beautiful. So light and airy, I love it. Looks like you are more than ready for summer. Your home is darling. I love the way in which you have used everyday things (like the hankies in the dining room and cards above the bed) to decorate. Enjoyed the tour! I would love to win the $30 to Decor Steals. Thanks for sharing your home with us. Your home looks great. I would love to be entered in your give away. Honestly, Jennifer, just when I think your beautiful home can’t possibly be improved upon, you outdo yourself! It’s so impossibly gorgeous dressed up for summer with flowers and pops of perfect color here and there. I love your bedroom quilt and can’t wait to see the whole reveal tomorrow. Enjoy your day! 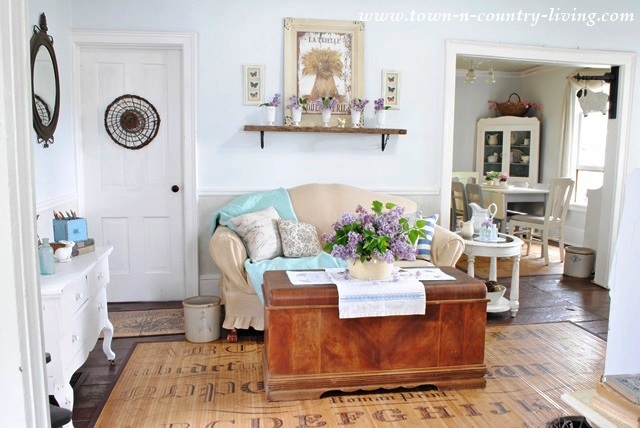 What a beautiful, vintage, collected, comfortable home you have – I absolutely love it!! So much amazing character and interesting things everywhere you look. So fun to be on this tour with you!! love the white kitchen and the aqua accents in your living room! Who doesn’t love a good gift card! Please enter me to win. Love your home! Thank you for the tour…it is inspiring! I love the vintage hankies, and your phots inspired me to use several of my grandmother’s hankies in similar ways. A wonderful way to bring summer into the house and remember a wonderful grandma. Oh, and please enter me in the Decor Steals gift card giveaway. Love … love your house!!! Porches get me every single time!!! 🙂 ….. thank you for sharing!!!! Excited to see the newly painted exterior when it’s all done too!!!!! Your home is amazing! Thank you for the tour and the chance to win the Decor Steals gift card! What a fun house tour! Would love to get something from Decor Steals! I always love your posts showing your home, it is so lovely! I also love Decor Steals, and would love to win! Loved the tour of your home. And of course I would love to enter to win! Love seeing your emails each day! Love your decorating…please enter me in the Decor Steals giveaway. I check them out each day also and would appreciate a win! Thanks for opportunity. Thanks for sharing your home with us! I’d love to win the gift card and would like to enter. pick me 🙂 love your home! So beautiful! You have a home that feels so comfortable. Like sinking into a huge fluffy sofa, wrapping yourself in a cozy blanket, and reading a good book. Does that make sense? I hope it does… I mean it as a wonderful compliment! I found you through the link up party at diy show off! What a gorgeous home! Please enter me in the Decor Steals giveaway (love their stuff). I’d love to win! Wow, what a beautiful tour! I love how everything is so light and bright and welcoming. And your home has so much gorgeous character! It has been fun being on this tour with you! Have a great weekend! Your home is absolutely charming! It looks like such a lovely and cozy place- truly a home!! I love Décor Steals. I drool/dream everyday with their selections. Your home is lovely. Thank you for sharing with us. Love your summer home tour! My favorite is the Painted Buffet vignette. Thanks for sharing and offering a giveaway! I truly love Décor Steals – I have made quite a few purchases from the already and couldn’t be happier!! I would love to win a gift card!! Sign me up! I’d like to enter & win this, also. Love your house! Love your bright and cheery porch! Perfect for summer! It was a lot of fun to do this tour with you! A complete dream house for me – if I can get mine 1/4 as beautiful as yours I’d be one happy old home owner!!! LOVE your kitchen – especially the floor – it’s the perfect offset to the white. Jennifer, I always enjoy visiting your gorgeous home. I love the touches of aqua you have added and the cottage feel it is taking on. I hope you have a perfect summer. Love your tour! That kitchen is so pretty I would love having coffee in there every morning, beautiful job! 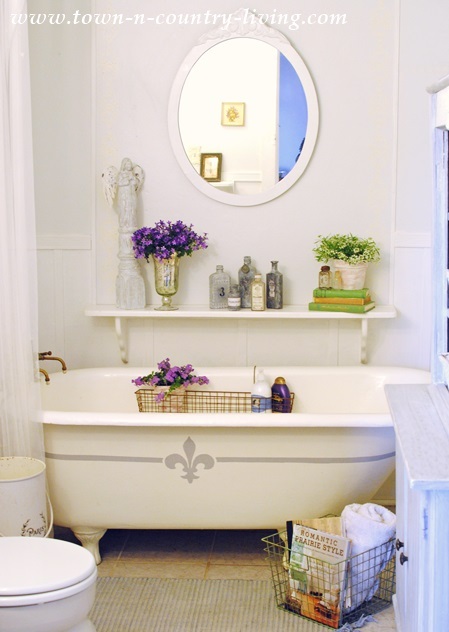 Love your use of flowers in every room, Jennifer– even in the bathtub! 🙂 Would also love to win the gift card to Decor Steals– especially want to buy the Milk Bottle Flower Holder. Thanks! Loved the tour, especially all the white decor and flowers! 🙂 Your home looks so fresh and summery! I would love to win the milk bottle flower holders. It may be too late for me to enter the giveaway, but I am so happy I found you via Instagram today!! What a beautiful home, and such a great blog. I have to catch up on all I have missed now! Thank you for sharing your home with us. It’s what I’ve always dreamed of.. I just love the bead board and you gave me some ideas for shelves. Please enter me in your give away! Thanks again! I love your farmhouse! We are slowly turning our 1983 Cape Cod into our Texas French Farmhouse. I wait every morning for Decor Steals to pop up in my Inbox! Thanks for entering me in your giveaway! 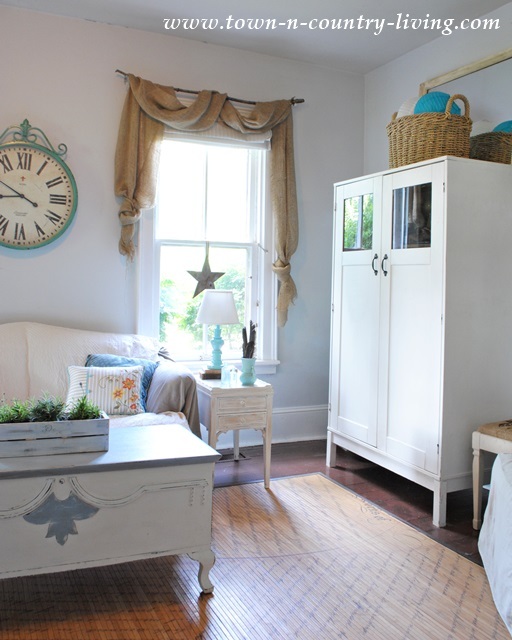 Jennifer, I’ve always enjoyed looking at your house through the blog and really love all the furniture pieces. I also collect at thrift shops and curbsides, but haven’t yet gotten around to transforming everything. One of these days I’m gonna quit my job and concentrate on my house! Meanwhile, I’d love to be entered in your giveaway. Thank you for offering it. Your home…everything about it….LOVE! I love the era it was built and all the wonderful details, right down to the squeaky floors. Thanks for the inspiration! Love all of the white and blue….my favorite colors! Thanks for sharing with us. Love your burlap swags, can you tell me the measurements, etc. Is this the same kind of burlap that you would find at Hobby Lobby? Love your whole house, everything is beautiful! Beautiful home! I would love to win! Too late to enter, but no matter: really just wanted to tell you I love your house! I always wanted an old house, but I let all my family talk me out of it….now I’m “settling” for a brand new one! I want to enter to WIN! 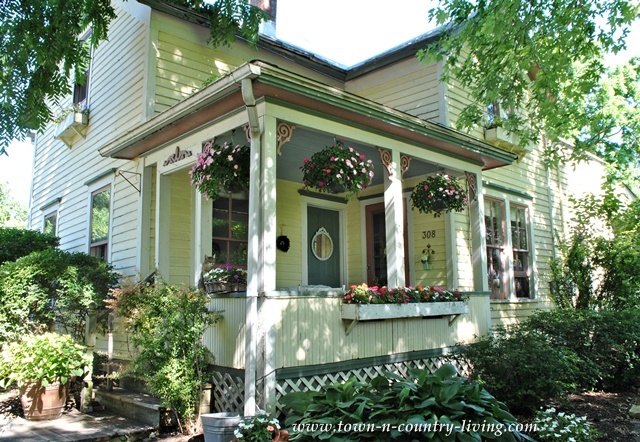 Love your blog and house…love tours!